South East Asia… Part Three: Sumatra Continued – Tangkahan. After our time in Bukit Lawang with the orangutans we organised a driver to take us the 4 hour journey by 4×4 along the back roads of the palm plantations to Tangkahan. The beat up 30 year old Daihatsu that took us was crazy, the doors didn’t close, the windows where falling apart, every dial and gauge was broken except the speedo and as always in Sumatra there are no seat belts. The journey was quite nice really, it was slow going as the dirt track was so bumpy we rarely got over 20 mph, we got to see some epic views on the way, millions of palm and rubber trees and plenty of locals going about the business. The craziest part was when we reached a very steep muddy section on which a empty mini 4×4 pickup truck had gotten stuck and they were loading the truck up with rubble to get more weight on the tyres. As this was blocking the road our driver offered to give them a push. He rammed our 4×4 up the back of this tiny pickup and floored it! The noise was immense, mud flying everywhere, all 8 wheels of our vehicles spinning at full pelt, huge plumes of jet black smoke coming of our car and both cars sliding around all over the place, it felt like a scene from top gear but it did however work.. It took 2 attempts mind and the van veered wildly to one side and nearly ended up fully sidewards, then rolled back and hit our car as the hill was so steep and muddy the truck could not even remain stationary on its own. After this little rescue mission we completed the journey and arrived in Tangkahan and checked into a £6 a night room with a balcony overlooking the jungle and river. We spent the rest of that day walking around the village, which sat at the spot two rivers merge. 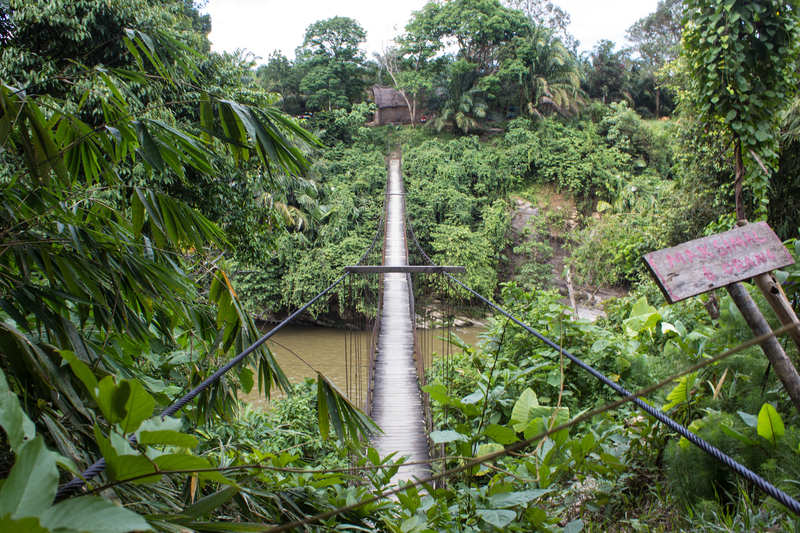 We had to cross a death defying rope bridge to get to our hotel but the benefit was the bar is perched on a huge rock that overhung the smaller tributary where we could watch the locals and the wildlife. We had arrived on a sunday and the village was busy with locals who had travelled from far and wide to enjoy a day swimming and bbq’s at the river side, but once they left we found ourselves with a wonderful evening swimming in the river with not a soul around. The next day we arranged to visit the elephants that the village is well known for, these captive elephants are used to patrol the jungle with armed rangers to help stop illegal logging and poaching in the national park, these sumatran elephants were originally wild but conflict between farmers and the elephants was fueling anti elephant sentiment and by capturing and training them they were able to turn the conflict into a benefit with both jungle patrols protecting the national park and ecotourism generating money to fund that and the village. We had some reservations about visiting any captive animal organisation, with the horror stories of how elephants have been treated elsewhere, but Tangkahan seemed to be a more ethical operation and we just could not resist the temptation to see them. We met the 9 adult elephants and 1 baby ‘Amelia’, as they wandered freely around their large shaded enclosure and then watched as the where walked down the river side by the rangers, they were directed into the river for a bath, after which they lay down in the river and we all got to jump in with them and give them a good scrub clean. 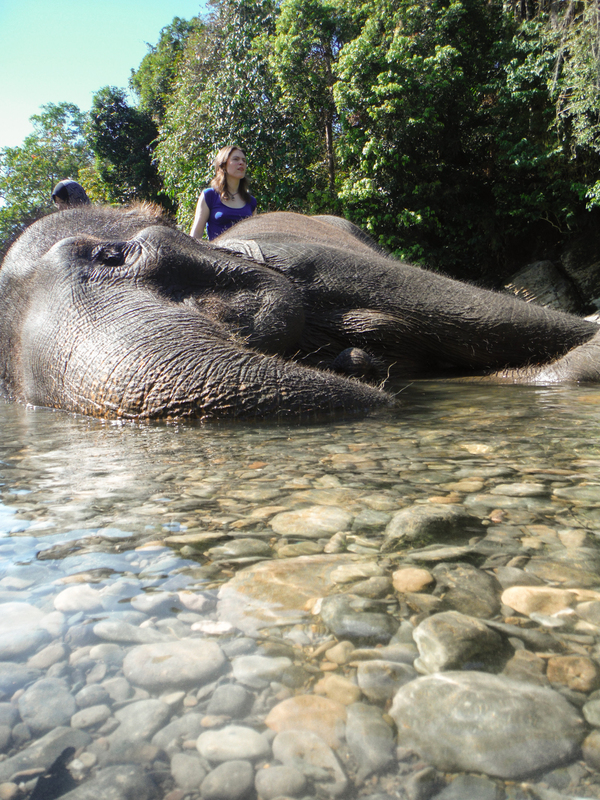 It was unbelievable standing in the river with our arms around these huge animals, their massive ears waving around as we cleaned them and being able to put our hands round the huge tusks of the male as he lay there enjoying the lazy bath. Our elephant, ‘Unia’ particularly liked having water splashed behind her ears. It was awesome. After this was time for the elephants to clean us, they filled their trunks and placed the end of their trunk on our foreheads for a ‘kiss’ and blasted us with the cold river water! One of the elephants seemed to like doing this so much she just wouldn’t stop soaking us all. After the washing 3 of the adults were geared up to take us on a trek along the river and through a bit of the jungle. Me and Lou sat upon the elephant we had just washed and she and her mahout Tete took us on a hour long trek down stream, through the jungle and wading through the deep river back to the village. It was a great experience, we even got to sit where the mahout does on the elephants shoulders while she took a 20 minute break to graze. The afternoon was spent swimming in the river, we found a thermal pool in the rocks where the water temperature was like a hot bath, we watched some big lizards swimming, a troop of monkeys making there way along the river side and at one point we watched 2 monkeys jump from 7 meters off a cliff into the river and swim underwater to cross it. Watching them from just above where the jumped was a sight indeed, seeing them swim under the cristal clear waters was unbelievable. The next day we organized a car to takes away from this wonderful place so we could continue our trip to the very tip of Sumatra and beyond.